Some of us tend to work in some calm and cool place. And this is a fact that when the working environment is cool and calm the output of the person gives more output. Moreover, having a room full of scented oils and aroma gives pleasure always. And for this market is full of room fresheners but these room fresheners are made of artificial chemicals and can be harmful to health. 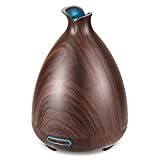 but there is another solution for this problem and here comes into play the oil diffusers.Apart from making the environment, calm oil diffusers help in the aromatherapy. The oil diffusers can make your mind calm by spraying small amounts of scented oil in the rooms. But how to choose a good oil diffuser is a big task. So to help you out we are presenting 10 oil diffusers present in the market which can be bought online. 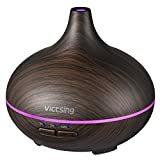 The Essential TaoTronics Oil Diffuser is a 300 ml oil diffuser. This is best used to add moisture to your dry room. It also prevents dryness of your skin. 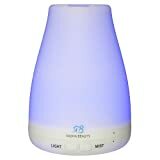 The essential oil diffuser provides the light functions up to 7 lights. You can change the light according to your mood. Moreover, it is 100% baby safe and can be operated near the babies. 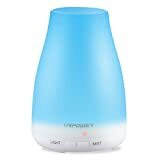 The URPOWER essential oil diffuser is a medium sized having a capacity of 200 ml. This capacity is neither too big nor too small. The body of the oil diffuser is made of wood grain and has a compact design. Moreover, this device is very easy to refill. It produces about 35-70 ml of mist per hour. It can run for 5 hours approximately. 4 timing settings are available with the oil diffuser. You can opt for the settings that suits you. 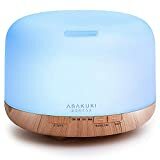 The askuki 500 ml oil diffuser is a perfect oil diffuser device that can help in healing process and aromatherapy. It provides you with a large tank of 500 ml. This has a feature of auto shut when it detects that water levels are running low on the device. It prevents the device from the overheating. Apart from the aromatherapy it also improves the quality of air by diffusing the oil particles in the air. The capacity of the Deneve Essential Oil Diffuser is about 100 ml. it is more than enough for a small room. The oil diffuser provides the functionality of auto shut when it detects that water level is low. It works with a 100-240V Ac adapter. And moreover, it provides the option of using multiple oils. but you should always clean the device weekly with a mild soap to keep it in perfect condition. Now this device has a rating of 4 stars on amazon.com. 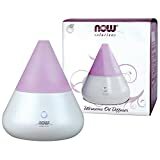 NOW oil Diffuser is BPA free and makes use of high-frequency ultrasonic electrical vibrations to break down the oil particles into a fine mist. This list is very helpful in the aromatherapy. Moreover, it does not, uses the heat to break it down so the properties of oil remain as it is as in the oil. it is perfect for daily use. But the device needs a cleaning process after each use. It also has the function of automatically shut-off. 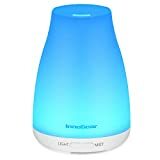 Innogear aromatherapy is also one of the best oil diffusers present in the market. It has 7 LED lights and really helps you to lift your mood. It is a smart device and works very smartly. It automatically detects the low levels of humidity in your room. It prevents the dryness of skin in the winter season. it has a function of auto cut. It prevents the burning up of device by shutting down itself when the water levels are low. Moreover, it is best suited for a children room as it has the function of bright and dim light in it. URPOWER also bring you a new oil diffuser in this range having a large capacity of 500 ml. This capacity is more than enough for an oil diffuser. It has multifunctioning. It can be used for aromatherapy, humidifier, and also for night light. It has ultrasonic diffusing technique. This helps it to break the oil and water into smaller particles. It can run almost up to 10 hours continuously. Victsing provides you with the function of 14 led lights. First they have 7 lights then also provides you the function of dim or brighter light. The safety features are very good. They have 3 options for use. 1h/3h/ continuous. The capacity of the oil diffuser is about 150 ml. and it has an option of auto cut-off after the water runs out. This prevents the devices from burning up. The company provides 1-year warranty on the product. Also one of the best-reviewed product on amazon.com. Radha beauty oil diffuser has a capacity of 120 ml. it is a smart oil diffuser. It uses ultrasonic waves to vaporize the water and the oils in its tank. In this way the oil is spread to every corner having a cool environment. Also when the water levels are low then it has a function of auto cut-off. It can run up to 4-5 hours depending upon use. It also has the function of different patterns of light. 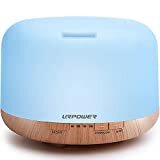 One the most selling oil diffuser the URPower Oil Diffuser is best suited for 130 ml. it has the features of 7 colour changing Led light which can set your mood. Moreover, this product is compact in, so there is no problem in keeping and storing it. it has its effect in the rooms up to 215 sq. not only in homes but it can also be used in the offices and stores. It runs on 2 modes. It can run for 3-4 hours continuously or you can also set it into time intervals of 30 seconds. This way it runs up to 6 hours. The company is also providing 90 days’ money back guarantee and 1-year warranty.